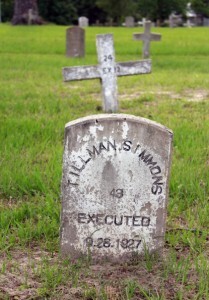 A cemetery for prisoners in Huntsville, Texas. Grave markers with an “X” or the word “Executed” indicate the prisoner was put to death (Photo Credit: Chantal Valery/AFP/Getty Images). On July 30, 1964, the state of Texas executed Joseph Johnson Jr. He was one of the 21 African-Americans put to death in the Lone Star State in the 1960s, out of 29 executions overall. But his was also to be the last execution in Texas for 18 years. In the late 1960s, executions in the United States dwindled and in 1972 the U.S. Supreme Court overturned all U.S. death penalty laws. New death penalty laws were permitted in 1976 and executions resumed the next year. However, it was not until late 1982, more than 18 years after Johnson’s execution, that Texas would restart its machinery of death. Since then, Texas has been responsible for, by far, more executions than any other state. On June 26, Texas is scheduled to put Kimberly McCarthy to death – in the process carrying out its 500th execution since reinstatement. The continued high use of the death penalty in Texas (though at a lower rate than in the so-called “zero tolerance” (1990s), flies in the face of the overall U.S. trend, which has seen death sentences, executions, and public support for capital punishment dropping steadily. Texas itself is not immune from that trend, as death sentences in the Lone Star State are now at historic lows. Are the people of Texas – at least when they sit in the jury box – having second thoughts about the death penalty? It wouldn’t be too surprising. As a sampling of the state’s grim history of executions makes clear, capital punishment in Texas has consistently been biased and error-prone. Just after midnight, December 7, 1982, Texas executed Charlie Brooks with a lethal cocktail of three drugs. It was the first lethal injection execution in the United States and the first execution of any kind in Texas since 1964. Brooks was the first African-American to be executed in the U.S. after the reinstatement of the death penalty in 1976. Brooks had been sentenced to death for murdering an auto mechanic named David Gregory, but it was unclear if he or his accomplice had pulled the trigger and the prosecutor had tried to stop the execution. Amnesty International said the lethal injection was “especially repugnant” because “medical techniques and personnel are meant to sustain life, not take it.” There have been over 1,100 lethal injection executions in the U.S. since then (498 of them in Texas) and every executing state now uses lethal injection as its primary killing method. The participation of health care professionals and the role of pharmaceutical companies in executions continue to rouse controversy, but not yet enough to halt the practice of using people and products meant for healing to take life. In the so-called “modern” era of capital punishment, since the death penalty was reinstated in 1976, the USA has almost certainly executed prisoners despite serious doubts about their guilt. One of them may have been Carlos DeLuna, who was put to death in Texas in 1989 for the killing of gas station attendant Wanda Lopez in Corpus Christi. A comprehensive report and website by James Liebman and a team of students in the Columbia University Human Rights Law Review makes a compelling case for DeLuna’s wrongful conviction. This report, Los Tocayos Carlos, followed on the heels of an investigation by the Chicago Tribune, amplified by the film At the Death House Door, which already made it fairly clear that Texas authorities had the wrong Carlos. Carlos Hernandez was the other Carlos – the man Carlos DeLuna said had stabbed Wanda Lopez. At the trial, prosecutors declared that Hernandez was a “phantom” made up by DeLuna. But in fact, he was well-known to Corpus Christi law enforcement as a man with a propensity for violence and a love of knives. A career criminal who was almost always out on parole, he continued to assault women after DeLuna was sent to prison. Hernandez repeatedly told others that he killed Wanda Lopez and that a tocayo (namesake) was paying for the crime. A former detective admitted that tipsters had told him Carlos Hernandez was the real killer of Wanda Lopez, but that information was apparently never pursued. A decade later, Cameron Todd Willingham was executed in 2004 for killing his three children in a fire that Texas investigators determined, using deeply flawed forensic fire science, to be arson. In 2011, the Texas Forensic Science commission reopened the case and published in its final report that there was no scientific reason to believe that the fire was arson at all. Texas Governor Rick Perry had information about the flawed arson investigation at the time of the execution and later tried to quash the reopened investigation. The Innocence Project now considers Willingham to have been wrongfully convicted and his supporters are seeking a posthumous pardon. Karla Faye Tucker was put to death in Texas on February 3, 1998. She was undoubtedly and undeniably guilty (along with her boyfriend Danny Garrett) of murdering Jerry Dean and Deborah Thornton. Former Governor George W. Bush had the option of offering Tucker clemency, which allows the executive branch of government to intervene in a case when the courts can’t, or won’t, based on factors outside the purview of the law – factors such as remorse, rehabilitation, and mercy. Instead Bush showed no mercy (he reportedly would later mock Tucker in an interview with Tucker Carlson in 2004) and Karla Faye Tucker was executed. In fact, as we approach 500 executions, there have been only two grants of clemency in Texas. On top of the flawed legal process that allows for bias and wrongful convictions, the clemency process is more or less non-existent. Karla Faye Tucker became the first woman put to death in Texas since 1863. Two more have been executed since then and the 500th execution (unless there is a stay) will be of a fourth woman, Kimberly McCarthy. Leonard Uresti Rojas (executed December 4, 2002) is one of many to be executed in Texas despite major questions about the competence of their lawyers. In his case, the appellate attorney appointed to Rojas was on probation with the state bar, had never handled a death penalty appeal, suffered from bipolar disorder and missed multiple deadlines to file appeals on Rojas’ behalf. The missed deadlines made it impossible for Rojas to challenge his death sentence in federal court. But this all-too-common poor performance by a lawyer, noted by a federal judge, did not stop Texas from putting Johnny Joe Martinez to death on May 22, 2002. Napoleon Beazley (executed May 28, 2002) was only 17 when he carjacked and killed John Luttig in 1994. He was one of 13 juvenile offenders executed in Texas before the Supreme Court outlawed such executions in 2005. 8 of those 13 were African-American, and 12 of the thirteen were sentenced for killing white victims. Napoleon Beazley, who was black, was convicted by an all-white jury in 1995. The victim, John Luttig, was white. As Amnesty International reported, Beazley had no prior arrests, but the prosecution refused to consider a pre-trial plea arrangement in which Beazley would plead guilty in return for a life sentence of 40 years without parole. The same prosecutors accepted a similar plea bargain in the case of a white man who was sentenced to 45 years in prison, with parole eligibility after half that time, for the racially motivated killing of an African-American homeless man in 1996. Though the execution of juvenile offenders has been barred, Texas continues executing those who committed crimes as teenagers. Bobby Hines was 19 at the time of his crime, but was executed by the state of Texas on October 24, 2012. Kelsey Patterson (executed May 18, 2004), was assessed as mentally fit for execution by Dr. James Grigson, despite diagnoses that he was severely mentally ill. Grigson was nicknamed “Dr. Death” for his willingness to testify against capital murder defendants. Through a decades-long staple in Texas capital hearings, “Dr. Death” was later expelled from the American Psychiatric Association and Texas Society of Psychiatric Physicians because of his unethical, unscientific testimony in such cases. Governor Rick Perry ignored a rare recommendation of clemency from the Texas Board of Pardons and Paroles and allowed Patterson’s execution to proceed. In 2007, a study conducted by the National Alliance on Mental Illness (NAMI) revealed that Texas ranked 47th in the nation in per-capita spending on mental health services. On October 13, 1980, Willie Williams and Joseph Nichols (executed January 31, 1995, and March 7, 2007, respectively) robbed a Houston deli and in the process, Claude Schaffer Jr., the store owner, was killed with a single bullet. Both men were convicted and executed for firing that one shot – Williams, under then Governor Bush and Nichols in 2007, under Governor Perry. Nichols, like Williams, got the death penalty for being the man who fired the one fatal shot. That the courts and Texas authorities were unable, or unwilling, to address this obvious contradiction tells you all you need to know about the Lone Star State’s zeal for executions. Humberto Leal Garcia (executed July 7, 2011) was never informed upon arrest that as a Mexican national he was entitled to legal help from the Mexican consulate. This was a violation of the Vienna Convention on Consular Relations, and may have been the difference between life and death. There have been 12 executions of foreign nationals in Texas. Garcia’s case was just the most recent. Mexico brought a case against the United States before International Court of Justice on the issue of nationals being denied their consular access rights. In 2004, the Court ruled in favor of Mexico, and then President George W. Bush tried to intervene to provide relief for foreign nationals on U.S. death rows. The state of Texas challenged President Bush, arguing that he did not have the authority to direct the judicial branch of government. In the Supreme Court case, Medellin v. Texas, the Lone Star State got its way and so far, the World Court judgment against the United States has had no effect. Marvin Wilson (executed August 7, 2012), with an IQ of 61, well below the threshold of 70, should have been ruled “mentally retarded” and thus ineligible for execution. The U.S. Supreme Court, in Atkins v. Virginia, banned executions of the “mentally retarded” in 2002. But by unique and unscientific standards, based partially on the child-like character Lennie from John Steinbeck’s Of Mice and Men, Texas courts held that his execution was permissible. Race and the death penalty have been intertwined in the U.S. for centuries. As a legacy of slavery and its attendant punishments, and then of lynching, capital punishment has historically been infused with racial bias. A recent study has confirmed that prosecutors in Harris County at that time (during the 1990s) were three times more likely to seek death against African American defendants than against white defendants. According to the NAACP Legal Defense Fund, roughly half of the African Americans on Texas death row were put there by Harris County. Have things gotten better since the ‘90s? In one sense, yes. The good news is that use of the death penalty is waning in Texas; executions and death sentences have dropped considerably over the last ten years. But despite the racially charged testimony in his case, Duane Buck could still face execution. And racial disparities in Texas capital punishment seem not to have diminished at all. Last year, 7 of the 9 people sentenced to death in Texas were African-American. This year, 6 of the 7 people executed so far in Texas have been African-American. No sampling of Texas death penalty cases would be complete without mention of the tragic case of Cesar Fierro. He has not been executed, due at least in part to his deteriorating mental condition, but remains on death row (where he has been for 33 years), his life effectively destroyed. When courts discuss “harmless error” they mean to acknowledge that mistakes were made, but that those errors would not have affected the outcome of the trial. In the case of Cesar Fierro, a Mexican national who was convicted and sentenced to die for the 1979 murder of a taxi driver in El Paso, the evidence against him consisted of the testimony of just one witness, and a confession. The message and threat were clear and Cesar Fierro confessed. Despite his attempts to retract it, Fierro’s confession was admitted into evidence and in 1980, he was sentenced to die. In 1996, the Texas Court of Criminal Appeals ruled that admitting this confession was indeed an “error,” but, stunningly, that it was “harmless” (because there was one witness). At the federal level, after making a “preliminary determination” in 1997 that this Texas court ruling might be wrong, and the error might not be harmless, the 5th Circuit Court of Appeals in 2002 dismissed Fierro’s habeas corpus petition on procedural grounds (“barred by the one-year statute of limitations”). Despite the efforts of Amnesty International and other human rights groups, the death sentence has remained in place for over three decades. It is mind-boggling both that the state’s highest court would rule that a confession extracted under threat of torture could be considered “harmless.” And that ruling seems to have set the bar pretty high for trying to prove harmful error in a Texas court. But in fact, capital punishment in Texas is full of errors, and none are harmless. 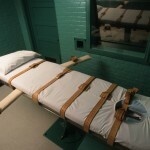 From a sometimes nonchalant approach to investigating crimes, to the dismissive attitude towards the importance of a decent lawyer; from the routine rejection of clemency, to the routine rejection of international law; from the failure to respect the mitigating aspects of youth, or mental impairment, to the failure to address the ongoing effects of racial bias; the Texas death penalty is a colossal error-prone mess. And this mistake-prone system is about to churn out its 500th execution. This entry was posted in Death Penalty, Prisoners and People at Risk, USA and tagged 500th, abolish the death penalty, death penalty, detention and imprisonment, execution, harmless error, ineffective assistance of counsel, innocence, juvenile offenders, legislative and policy reform, lethal injection, mental illness, mental retardation, mercy, prisoners and people at risk, Race, Texas, u.s. death penalty facts, u.s. scheduled executions, Vienna Convention on Consular Relations by Brian Evans. Bookmark the permalink. I think all you liberals need to get a grip. It's not a black and white issue here. It's MURDER!!!! Helloooo! You think? No I can´t believe that you think. We should just put the government to death because they're killing people, according to that logic. If being against an atrocity like the death penalty is being "liberal", then I am. With pride. I completely agree with the post above. I really am so freaking sick and tired of black people coming out and saying when they have done wrong that they were discriminated against. Get the hell over it. Those women did not ask to be beat with meat cleavers and hammers. They were old and had lived their lives. This country has let "the so called discrimination defense go on way too long. Unfortunately we cannot undo history it was horrible. However that has nothing to do with this worthless vermin who made the sound decision to get addicted to crack. Then her only defense is she is black and and she was misrepresented in court. Get over it. You are a cold blooded murderer who will get the easy way out tonight. Her death will be painless and quick. Unfortunately her victims died a gruesome murder. It is a pity she cant get a taste of what she dosed out. I would really hate to be around when this piece of garbage meets her maker. You Americans are nuts. Hanging, shooting, injecting, jailing…I'm never crossing the border again…American Exceptionalism is a joke! This is certainly something that should be addressed moving forward. Get your blank ATM card today from me, i prepare cards that worth $70.000 with this card you can buy properties online and you can make maximum withdrawals of 3000$ daily from any ATM machine in your country, if you need this card contact me on my email ([email protected]) many persons have received this card and they have been saved from poverty and financial stress , get your card now.